For 2WD four wheel vehicles, 4WD four wheel vehicles, and 8WD eight wheel vehicles. Can be used in both "ground up" models (newly designed electric cars) or existing cars. 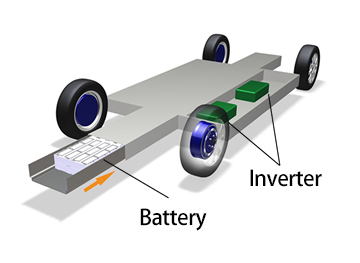 The car is comprised of a platform installed with a drive system consisting of an in-wheel motor, inverter, and battery. Cars installed with components certified by SIM-Drive will be labeled "by SIM-Drive" or "Platform by SIM-Drive". This is technology for inserting motors inside the vehicle wheels. The technology has been made feasible by developing a compact, high-efficiency motor. The main advantages are the high energy efficiency, large usable space in the vehicle body, and highly simple vehicle structure. While there have been concerns that this design, with the large weight under the suspension springs, would result in poorer riding comfort, demonstration tests have shown this not to be the case. Platform by SIM-Drive is technology for mounting all the important components for running inside the wheels and in a rugged frame structure located under the vehicle floor. The core technologies are the in-wheel motor located inside each wheel and the componentized frame, located under the floor and having a rugged hollow structure. This design results in an extremely simple body structure, enabling an expansive above-floor space and stable running. By installing motors in each of the wheels, large acceleration force can be achieved. 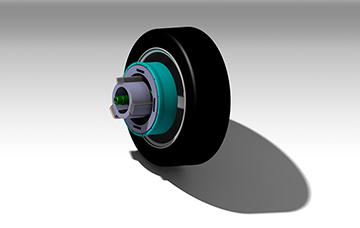 “On-board-direct-drive” (Figure 1) is a method that drives each drive wheel with direct drive motor one by one through drive shafts. There is no need to modify the original suspension mechanism because the direct drive motors are fixed in the original engine bay. 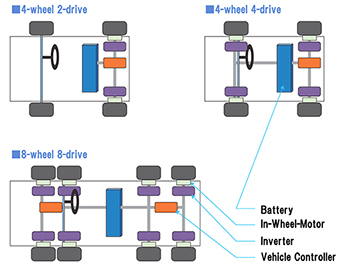 This feature enables our direct drive motors to be applied to electric vehicle conversion. Four-wheel independent control makes full use of characteristic that each wheel has independent motor and is a control system which can adjust each wheel’s torque independently according to vehicle attitude, load distribution, acceleration rate. Copyright © SIM-Drive. All Rights Reserved.